Light & Views - Where else would you find a true, large, new, light- flooded home with a South-Western exposure offering skyline and river views for that price? The apartment features floor to Ceiling Windows in the living room, an open kitchen with top of the line stainless steel appliances, Granite Counter top and Porcelain Tile Floors. Great closet space throughout the apartment, and a washer and dryer. The bathroom features Stone Bath, Espresso Wood Granite topped Vanity, and a large Medicine Cabinet. 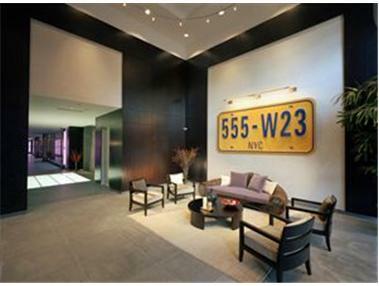 555 West 23rd Street is a full service building with many amenities: Full-time friendly and professional doorman and concierge, dry cleaning/laundry service, 2,000 sq. ft. gym, high speed internet in lobby, reception/party room, court yard and a garage. Located in New York's Most Exciting Neighborhood - Galleries, Restaurants, Chelsea Piers Sports Centers and High Line Park all Within Steps.